Before he attained notoriety as Dean of the Hollywood Ten—the blacklisted screenwriters and directors persecuted because of their varying ties to the Communist Party—John Howard Lawson had become one of the most brilliant, successful, and intellectual screenwriters on the Hollywood scene in the 1930s and 1940s, with several hits to his credit including Blockade, Sahara, and Action in the North Atlantic. After his infamous, almost violent, 1947 hearing before the House Un-American Activities Committee, Lawson spent time in prison and his lucrative career was effectively over. Studded with anecdotes and based on previously untapped archives, this first biography of Lawson brings alive his era and features many of his prominent friends and associates, including John Dos Passos, Theodore Dreiser, F. Scott Fitzgerald, Charles Chaplin, Gene Kelly, Edmund Wilson, Ernest Hemingway, Humphrey Bogart, Dalton Trumbo, Ring Lardner, Jr., and many others. Lawson's life becomes a prism through which we gain a clearer perspective on the evolution and machinations of McCarthyism and anti-Semitism in the United States, on the influence of the left on Hollywood, and on a fascinating man whose radicalism served as a foil for launching the political careers of two Presidents: Richard Nixon and Ronald Reagan. 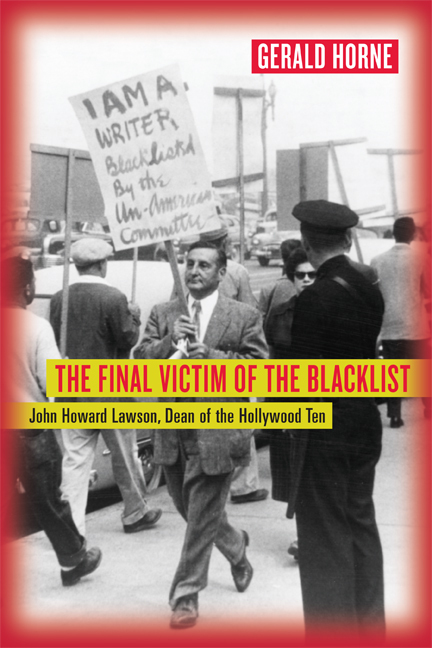 In vivid, marvelously detailed prose, Final Victim of the Blacklist restores this major figure to his rightful place in history as it recounts one of the most captivating episodes in twentieth century cinema and politics. Gerald Horne, Moores Professor of History at the University of Houston, is author of Black and Brown: African-Americans and the Mexican Revolution, 1910-1920, Class Struggle in Hollywood, 1930-1950: Moguls, Mobsters, Stars, Reds, and Trade Unionists, and Race Woman: The Lives of Shirley Graham DuBois.